Priscillas: It's Beginning To Look A Lot Like Christmas ! Last Saturday it started ! 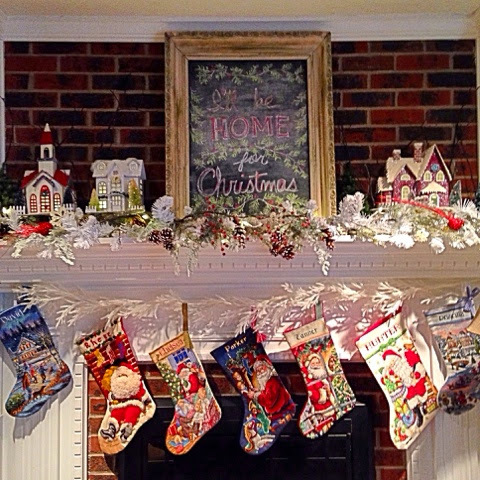 This was an in progress shot of the mantel .. More has been added ..I will be back to show you the completed mantel as soon as I finish up the trees so I can get some good pics ! These were all taken with my phone.. 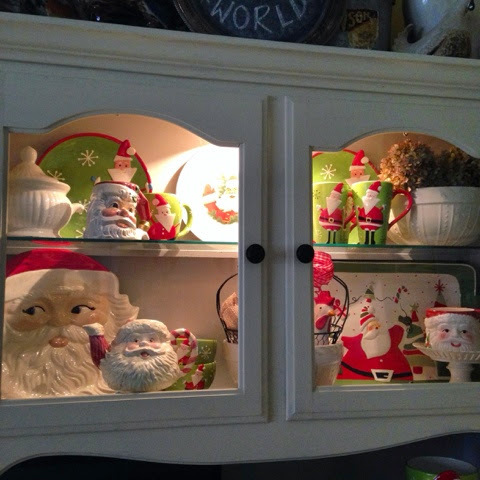 The hutch in the kitchen..
A vignette in the kitchen..Love my Fitz and Floyd ! and how it all started .......I have 9 of the 13 trees finished so far .. Hope to get 3 more finished today then in about a week get the real tree. 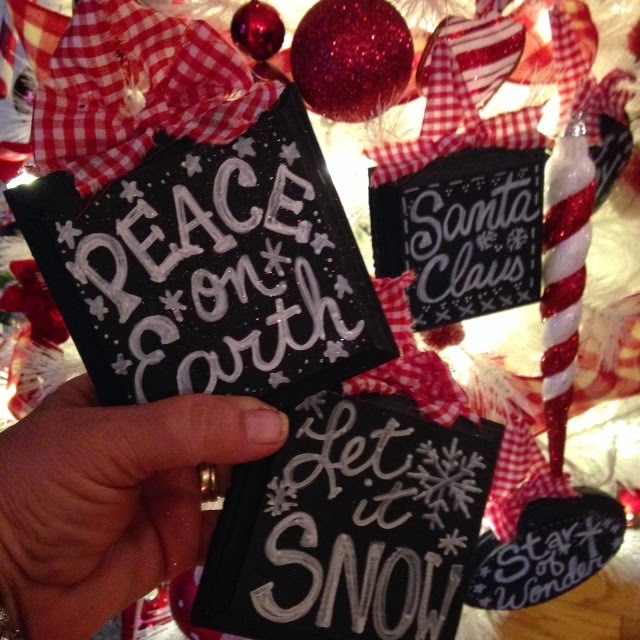 Still L-O-V-E these crocheted owl ornaments and chalkboard ornaments I made last year ! 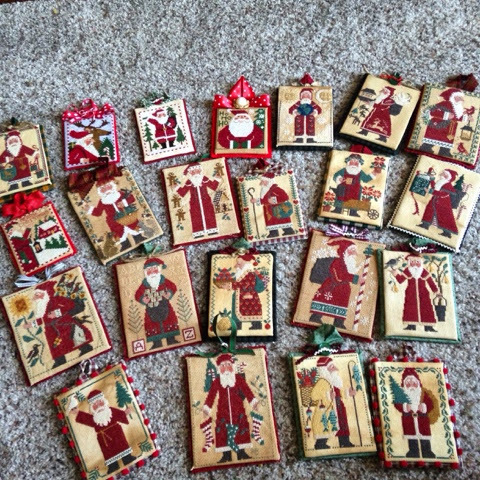 and my favorites .....The Prairie Schooler cross stitched Santa ornaments came out yesterday .. 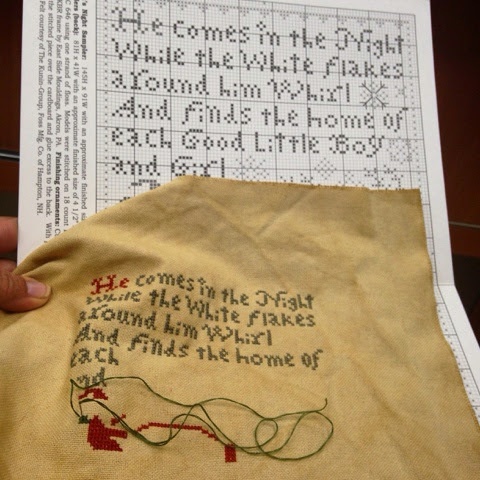 I still have 4 from this year that are stitched that need to be finished .. Hope I get around to that today ..I started stitching Santa's Night from the Prairie Schooler.. They show it on black but I wanted to go with the tea stained look ..Loving it so far..
Hope you have fun Halloween celebrations !!! Priscilla!! LOVE all of it and so looking forward to seeing more!! Your decorations are beautiful. 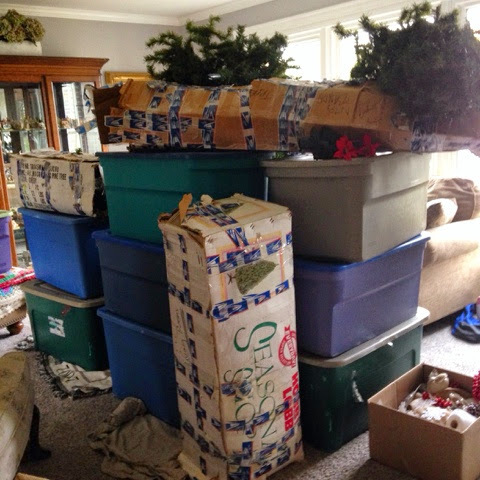 I may start decorating next week. OH my word!!!! WOW and I thought your Fall, Halloween was awesome!!!! BTW, so glad to see your stockings, I am working on the first one on left for my son, nice to see it completed! LOL wont be this year but probably next! I can work on it while recuperating from my knee replacement! lol Can't wait to see more! awesome! It is all looking so pretty and festive!! I love the kitchen hutch!!!! I won't even be thinking of de orating for Christmas until after Thanksgiving. I love my pumpkins!!! I love all your decorations. 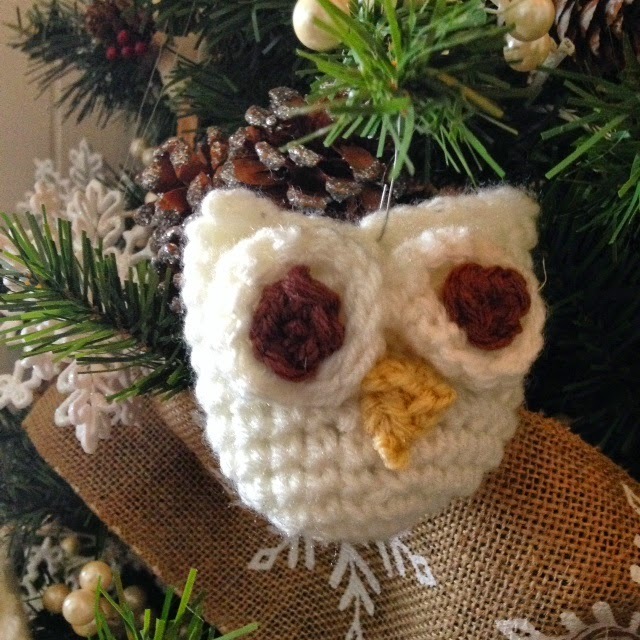 I really love your crocheted owl ornament. I would love to make one and maybe you could post up on your blog the pattern if you have one or a link. Thanks. 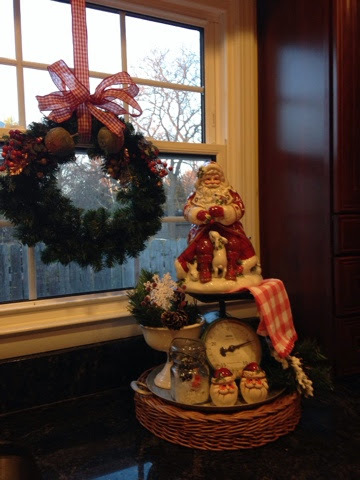 I am so ready to start decorating for Christmas. 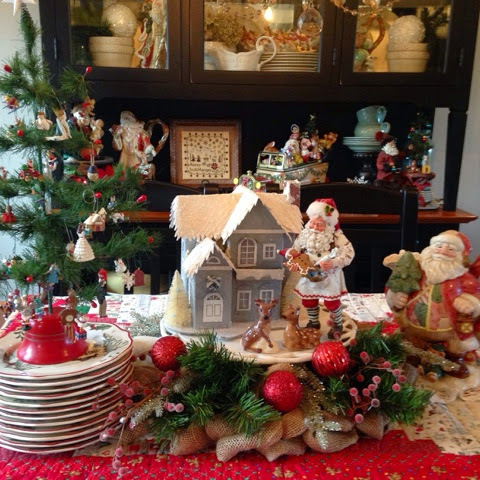 Your home is looking so festive and full of Christmas cheer. It's good to see and I think I will start next week. I love what you have done with your beautiful decorations . The tea dyed fabric looks great for the P.S. sampler . Are you using the same colours as the chart calls for ? You have really got a jump on it Priscilla. I will not start for a while yet. But I sure am enjoying yours! The hutch looks absolutely darling. Can't wait to see it up close and personal. lol! I remember your cute ornaments from last year and I love the tea dyed background for your stitch work! Thanks for sharing with SYC. Priscilla, you just don't stop to take a breath. Thank you for sharing what you are doing.. This will help me get started.. I just finished putting Halloween away.. I need to get busy..
Everything looks beautiful.. I will enjoy seeing your trees and other beautiful "pretties".. I am trying to catch up on your psts. Hope I can find a "kitchen tour":):) I love EVERYTHING!!! !